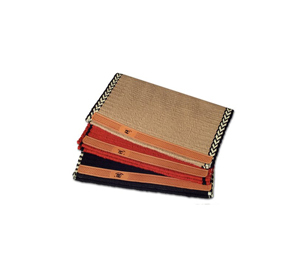 There are two terms that you should be familiar with when purchasing a wool saddle blanket, warp and weft. The wear leathers are made of Hermann Oak skirting leather. We offer long or short leathers and also a fancy scalloped one. We can also customize the leathers with brands, initials, or lettering. We offer several standard colors and also can do custom dying to match a favorite outfit, stable colors, etc. We feel they are absolutely the best blanket on the market today.